Due to a few extenuating circumstances (been a bit busy, I literally just got home 'bout a half hour ago.) that kept me away from my blogging duties, I was unable to post the last two reviews necessary to complete our Iron Fey week festivities on schedule. Because of this, I didn't think it fair to end the Iron Fey giveaway before posting, at the very least, The Iron Queen Review (which has been delayed due to the above mentioned circumstances). I will try my best to get that one up tomorrow, and The Iron Knight up Thursday, and if everything goes as planned, the Giveaway will end Thursday night. For now, I have extended it through Saturday night just to be on the safe side, so spread the word. For those of you who managed to get your hands on the book today, what are some of your initial thoughts about this fourth volume in the series? Is it meeting up to your giddy expectations? For those of you not yet reading, feel free to gush about what you're most excited for about this book. 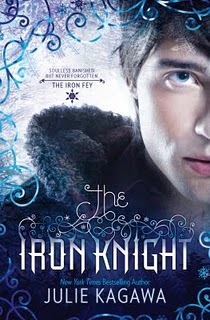 Please keep all discussion here spoiler free, for those who have yet not been lucky enough to crack The Iron Knight's cover. I have been looking forward to this book for a very long time and can't wait to get into this one! yay! great giveaway! im excited!